People are sometimes confused because of several advanced features that Alt Codes have. That's why I'll speak about those features here. If you have some problems with Alt codes, reading this will most likely end your misunderstandings. Sometimes people get confused thinking that my Alt codes list is not full. And I've even seen wrong Alt symbols listed on several web sites. Hope this article will help you not to get into trouble. Next are details on what comes out after you type different types and ranges of Alt codes. Rules are simple here. Alt codes 1 - 127 work same way as 01 - 0127 codes do. Omitted leading "0" can't cause any trouble here. Language-specific. This is because 128-255 codes make symbols from the extended ASCII set. And that one is different for all languages. Alt code 158 on Russian-language Windows encodes "Ю" character. Same time, on English Windows it is "₧". Omitted leading zero is the cause of this problem. Type "0code" instead of just "code" on your keypad for maximum compatibility. For example, use 0158 instead of just 158. Anyway, if you have English Windows OS - codes 128 - 255 are listed in Alt codes list too. Alt symbols with codes [N > 256], or [N > 0256] are same as the ones that have codes [N modulo 256]. For example, character that you can set with Alt code [0444 = 0256 + 0188] is "¼". Same as with code 0188, witch is "¼". Try by yourself. Although, there also exist "Rich Edit" alt codes with a higher range, which can only be typed in Rich Edit programs like MS Word. Those ones don't work in browsers. Notice: Alt codes work only under Microsoft Windows! You can stop trying to create symbols by using Alt codes if you are running another operating system (Linux, for example). But, nevertheless, you can use another keyboard codes to input cool symbol instead. Macintosh and Linux do have some other symbol codes instead. View Text symbols on Mac, or Keyboard symbols on Linux to find out about them. Keyboard symbols Type symbols by their keyboard codes. Contains information on Windows Alt codes, Linux symbol codes and standard Mac tools for special characters. Put them in documents, on Facebook, Myspace, your blog, etc. 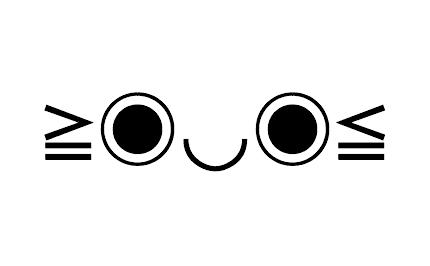 I want to use all cool symbols on fb. Help me!!! &hearts; is like the only thing I know how to do. Lol, awaiting your reply! &hearts; is an HTML entity, I've made a list of HTML entities as well. It's here: HTML entity codes of Special Text characters, so you can find out several more there. You can also find a list of cool characters for facebook: Cool text Symbols for Facebook ツ. And I don't really get why were you asking me that on this Alt codes page page, but when you were on, but nevertheless, if you haven't allready read about Alt codes - you're here. I can't make a Yin-Yang sign.... and how do I make the characters on the bottom of the Fb Chart? You can't input ALL those symbols using alt codes. You'll have to copy-paste most of them. What is the alt code to produce a cross out over a group of numbers? For a sale or to mark it wrong. There's no alt code, or symbol for this. This is done with "s" HTML tag. Write <s>Your text</s> (Your text) in a HTML text editor or something similar. When I do this I get a bell noise and nothing happens. Also when I turn on the "Number Lock" there is no light telling me if it is on or not. Then you certainly didn't enable "Num Lock". Try different ways that I've described in my video. If you won't figure it out - email me a photo with your keyboard to [ihor.ibm@gmail.com]. I'll try to help you. I have a Dell Inspiron 6400 and with "num lk"/"scroll lk" ON + pressing Fn + Alt + symbol code, I still cannot get the alt codes to work. I particularly want the heart symbol if nothing else. Please can you advise. 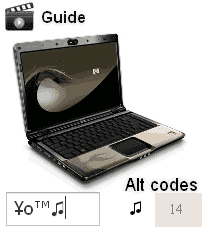 Firstly, if you have a laptop - check out Alt Code symbols on Laptop keyboard. Is there a code for like a brick wall or something like that? Nope, but you can find many of such characters at Cool text Symbols for Facebook ツ.
I'm trying to find the alt code list but I can't. Were should I go to? It's here: How to write symbols by using keyboard Alt codes. Do you know how to do the fluer de lis symbol? Copy-paste (How to copy-paste text symbols) ⚜. I look at all the code lists and still have not found how to make a star. :( Any help appreciated. You can't make a star with Alt codes. But you can do it in other ways. Read my Keyboard symbols article. Check out my guide on FB names: Facebook name with cool symbol letters. i want to know how to do this ツ without copy & paste!